Keep your Windows PC or Intel-based Windows tablet safe from viruses, ransomware, and more with Anti-Virus 2019 from Kaspersky. Offering a one-year license for up to three devices, this software utility automatically scans your PC for such online threats as viruses, ransomware, phishing, spyware, malicious websites, and cryptomining infections. 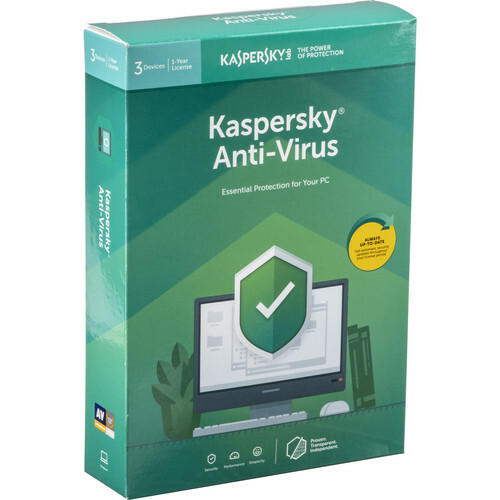 Anti-Virus can also help you repair and reset your system if it does get infected. The software is designed for simple setup and to run in the background without slowing the performance of your PC or tablet. Box Dimensions (LxWxH) 7.75 x 5.35 x 1.6"